Yeah yeah yeah I know they are expensive! Have you ever had the chance to really ride a bike with Marchesini wheels on it. There is a reason why you see all of those fancy race bikes in every discipline of professional road racing and supermoto racing wearing a set of Marchesini's or equivalent. 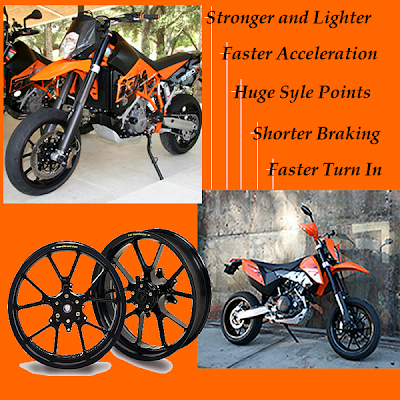 Other than the purchase of the bike and it's abilities in stock trim there is no better performance upgrade that you can do for your motorcycle than a set of forged aluminum race wheels. They are lighter and stronger accross the board. You don't have to worry about spokes anymore. You don't have to worry about pinch flats on your tubes because you don't have to run tubes anymore. There are so many reasons why they are better that I don't have enough room here to go into detail. I will give you the basics. You will be able to accelerate better, brake in shorter distances, turn sharper, harder and of course keep the front wheel up longer when showing off to the police. I am kidding about that last one. Or am I? You may want to consider a set of Marchesini's for your KTM 690 Enduro and 950 Super Enduro. Please contact me with any questions you may have.